A Waterford bicycle user who participated in the making of a Road Safety Authority video designed to highlight the danger of “blind spots” which can’t be seen by truck drivers says the video was faked. He had replied to an advert posted on the Waterford Institute of Technology Facebook page and reposted on the student union page. He contacted IrishCycle.com after a large number of commenters on the Road Safety Authority (RSA) Facebook page said that the video was edited or “faked”. The video has been viewed 118,760 times on Facebook, where the RSA has advertised the video, and around 2,000 times on YouTube. 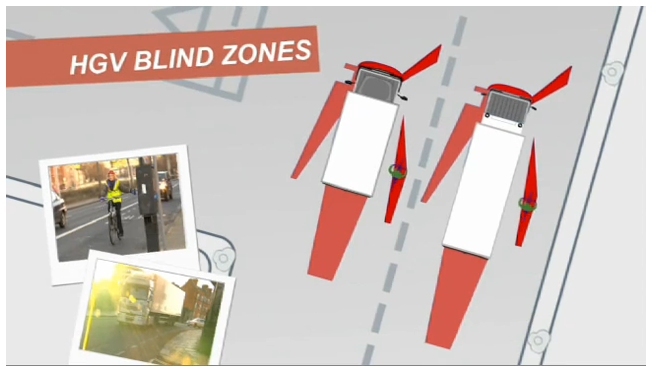 BLIND SPOTS ARE REAL: This still from an older video shows red areas which are known ‘blind spots’ in trucks — as the cabs of larger trucks turn the blind spots are enlarged. “I took part in the most recent RSA video with the truck and the cyclists and the claims [that the video was faked] are right if you would like an insight,” said Eoghan Patrick O’Hara. 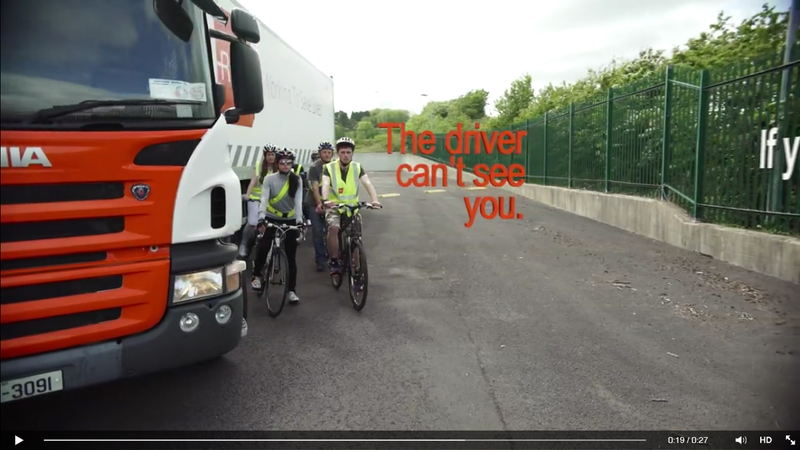 The RSA video starts with the camera in driver-seat of the cab of a HGV truck, the camera looks to empty mirrors on the left hand side of the truck, before the camera person gets out of the truck and walks around to see a number of people on bicycles who were not visible in the truck’s mirrors. The video is designed to be a copy of similar video made for Transport for London. 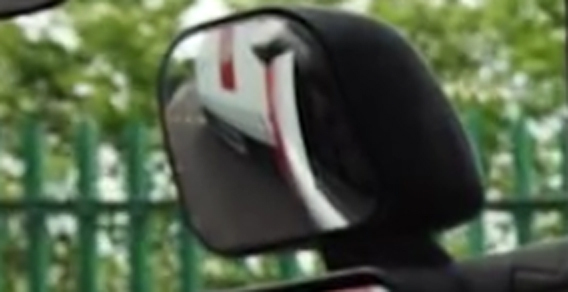 However, with the RSA video it is claimed that the people placed at the side of the truck should have been at least partly visible in the truck’s smaller, wide-angled mirror. This is backed by the location of the RSA logo on the truck and horizontal markers on the ground behind the truck. The RSA has denied that the video was faked. The comments of the RSA’s official Facebook page have gone unchallenged by the RSA — with no engagement by the authority with commenters. It still amazes me that vehicles like those trucks, are so badly designed that they would have such big blind spots, how could they possible be legal to drive on the roads. [RSA:] Who are you going to believe, me or your lying eyes? This is the same problem the 80s anti drug campaign adverts had. They might have a good point (and taking care around HGVs is an extremely good point) but when one aspect of your campaign is an obvious lie then the entire thing is discredited. 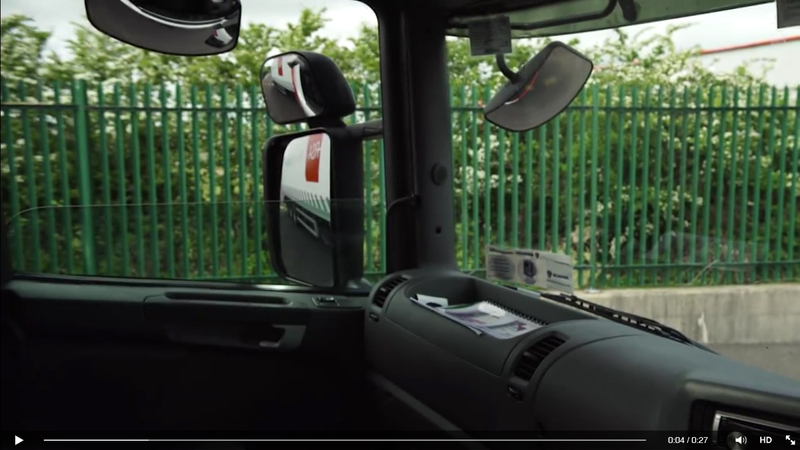 Personally I would not be at all surprised to discover that the mirrors are set up deliberately badly in the well known “sit in a HGV and see how useless their mirrors are” event. The main problem with wing mirrors is how little attention motorists pay to them. An eye flicker of a few microseconds designed to check for cars may not be enough to notice a cyclists even if they can be seen. Pointing this out wouldn’t lump all the blame on the cyclists though so it’s not as useful. There are some better New Trucks out there who have more glass Panels and the Cabs are made closer to the ground but nobody has bought them yet because of the cost. There was a Derogation from the EU of fifteen years before they would have to use more safer Trucks. I have heard this derogation has passed and yet nobody has started using the new safer Trucks. Is there information on these Trucks out there, when will they be phased in does anyone know. I hate those big Trucks still encounter them on the Malahide Road going into and from the Docks area. There is a few extra big ones like TKMAX and also Car Transporters. Worst time is heading home along the Malahide Road from the City where the Road is narrow opposite Kavanaghs and you encounter big HGVs. John, I never cycle that stretch, always preferring to divert through Marino on quite residential streets. There’s is just not enough space for safe cycling there. So, the cyclist who messaged you said that they moved from the actual blind spot to the ‘fake’ blindspot. To leave the cyclist over by the fence would have proved the same point with out the backlash. I presume the greater proximity to the truck looked more striking, and more clearly dangerous. The expediency of moving the cyclists has ultimately probably reduced the impact of the video, but the denial really insults everyone’s intelligence, and is made worse by sanctimonious scolding. So, McDonald’s customers don’t really smile while eating their burgers, women don’t experience actual orgasms while shampooing… Even if the blind spot angle changed a bit in the editing stages, what matters, surely, is the safety message. Well, if the blind spot angle isn’t all that important, why deny they changed the position of the cyclists? Also, it does change the safety message, although it is to a message the RSA are equally comfortable with: cyclists are actually invisible, at all times. They should remake the video in an urban environment with the truck cutting across a cycle lane painted on the road. They could also highlight the blind area to the front of the cab. 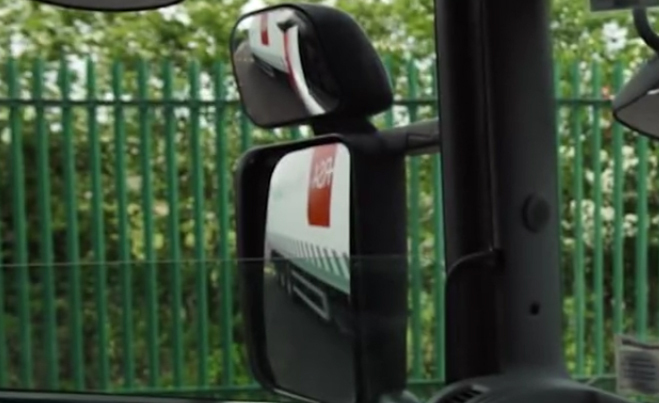 I suspect part of the problem was that they insisted that the mirrors be adjusted to perfection as it was an RSA branded truck. was this all done by the PR department? or what technical staff do they have involvedin these things?